Follow Columbia Regional Airport on Facebook. Have you caught this story on KOMU this week? The Columbia Regional Airport is rolling out the black and gold carpet for all the visitors from Georgia this weekend. Thanks to the new decorations, there will be no doubt for those arriving flights from Atlanta that they are in Tiger Town, USA. What a great example of branding by the airport (with a helping hand from the Mizzou Athletic Department). Columbia wants to be known as Tiger Town; and merging the identity of Mizzou with that of Columbia is a perfect step towards doing that. As we all know, the relationship between the University of Missouri and Columbia is a symbiotic one. Both draw from each other and help the other grow. Columbia Regional Airport is quickly becoming the front porch in our city with two airlines now serving the area. 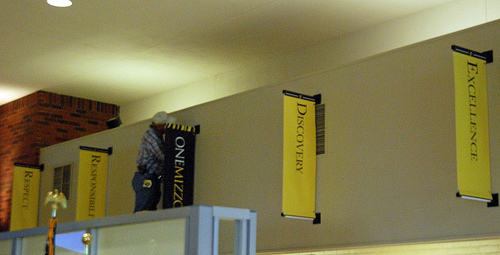 When visitors step off the plane, they will instantly associate the University of Missouri with Columbia and vice versa. That’s the best kind of branding there is because it shows the world that our community is united. Sure, it’s in the colors of an athletic department; but that stands for so much more than just a football team. It stands for Missouri. It stands for Columbia. It stands for all of us. And that’s the best branding of all.